This week our guest contributor speaks about ….. In April my wife Aileen and I visited Vanuatu and Solomon Islands as part of my research for my University Master’s Dissertation. My topic of study is the nexus between strategies used to market tourism by the flag carrying airlines and tourism management authorities, concentrating on the South Pacific and case studying Fiji, Solomon Islands and Vanuatu. As part of my project not only did I have to interview the airline and TMA management; I also had to interview service providers, NGO’s and other actors in tourism, in order to gain triangulating evidence. 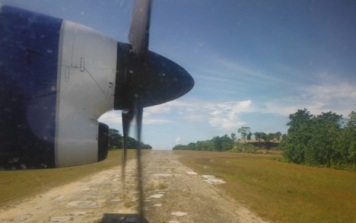 As a part of this we visited Vanuatu for five days and then flew up to Honiara, where after overnighting we boarded the Dash 8-100 “Megapode” for a trip up to Gizo in the Western Province. We stayed five days at the awesome Sanbis Resort, on an island near Gizo, then returned, island hopping from Gizo to Munda (where we saw first-hand the NZ funded runway sealing) and onto Seghe, where we witnessed first-hand the best ever airline customer service I’ve ever seen. 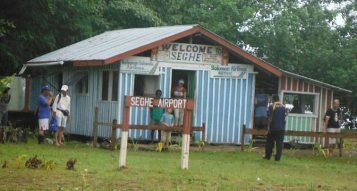 As we taxied to the terminal building in Seghe, the Solomon Airlines Chief Pilot Gibson Galo, who was flying, came on the P.A. “People, People, People, It’s so sad! There’s a boat load of tourists still trying to get to Seghe, who have connecting flights out when we get to Honiara. It’s so sad, because if we don’t wait, they’ll miss their flight from Honiara and then their connecting flights at Brisbane. So here’s what we’re going to do. You aren’t allowed out of the aircraft, so we’re going to keep the starboard engine running to keep the air conditioning going and we’re going to wait for these passengers” (We waited for around a half hour). 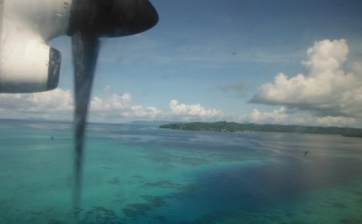 After take-off, and as we were heading over the Thousand Island Lagoon, Gibson came on the P.A. again, “People, people, people. Would all those with a connecting flight in Honiara please stick up your hand so our purser can see you”(14 very worried looking passengers put their hands up). “The purser’s going to take all your passport details and we’re going to radio ahead to Honiara and get a pre-clearance from Customs for you”. He did just that. After landing at Honiara we did a fast taxi past Domestic to the International apron and parked alongside the outbound airliner. Out on the apron, complete with desk, chair and stamp was the Customs official. Transferring passengers walked off our plane, up to him, had their documents stamped, walked to the door of the terminal and through the X-ray machine and then back out to the waiting airliner, while their baggage was similarly X-rayed and transferred. Awesome service! Which does show airlines can offer exemplary customer service when they want to!! GSB Card what its worth – for every $100 spent you are saving $13 on average. More when you look at some of the products we're buying click here. As a member you are entitled to a card so get in touch with Tim.Enright@gsb.co.nz. Tim’s a qualified pilot and has run a small aviation business so he knows and understands what its like for you. The card gives you instant discounts. Cards are available for your employees and your family. You can also become a GSB preferred supplier. Using the card essentially makes membership of this organisation FOC – now we think this is a major value add. 24 October Meet the Airways Board Venue: Royal Port Nicholson Yacht Club, 103 Oriental Parade, Oriental Bay. Time: 10am for morning tea, 10.30 meeting starts. 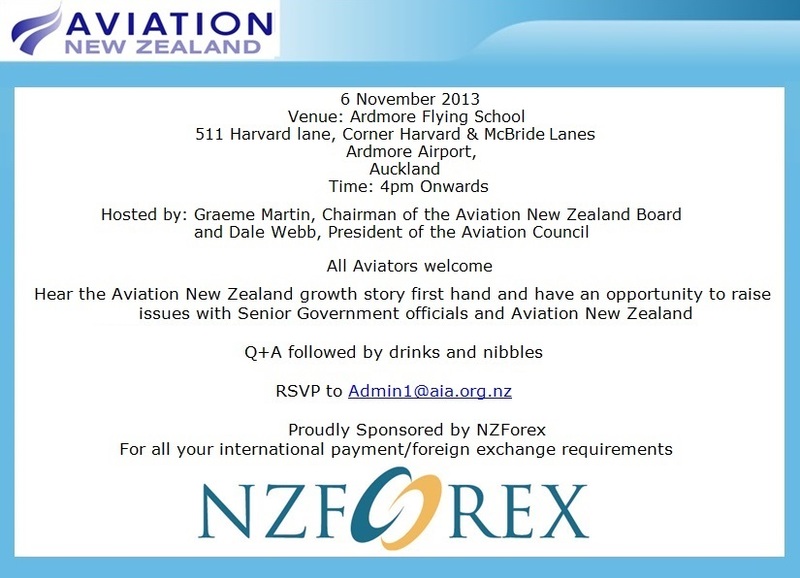 RSVP: Paola Brett, paola.brett@airways.co.nz. This is your chance to express a view. 25 October Productivity Council Submission on Regulations - click here – we’re preparing our response and would urge/encourage those aviation businesses who have the time to also comment. This may be one way of getting the very difficult issue of public v private v club good before government as some of the questions focus on pricing and the impact that has on regulator performance. 12 November – Commerce Commission Guidelines on Competitor Collaboration. We’re developing a submission and talking to Business New Zealand. IFR design Unattended Aerodrome click here – if you are affected please let us know as we have a potential collaboration plan emerging. October 15 DEBRIEF Radio Frequency Outside of Controlled Airspace - an excellent example of how Industry and CAA working together can develop a much better outcome. Well done to all those who attended and contributed in a very positive way. Common Frequency Zones are on their way but you’ve got to be also involved in the Airspace Redesign programme under way. This is a real life example of how SMS can contribute positively to much better outcomes for us ALL. Two changes to GST which impact on trainers and engineering/manufacturing exporters from 1 April 2014 and should improve competitiveness. Business to Business (B2B) contracts in the training area will permit GST refunds to be made to the international partner, provided that company has registered as a ‘non-resident business’ and is not carrying out, or intends carrying out, a taxable activity in New Zealand. Similarly, tools used to produce goods for export will also be exempt GST. IRD Tax Information Bulletin 25 No 9 October 2013 contains full information: http://www.ird.govt.nz/aboutir/newsletters/tib/vol-25/ The four critical pages for aviation companies are here. AIRCARE™ – we talk about the brand values of AIRCARE™ a lot. Why are they important? It’s about the signal these values deliver. It’s important to reiterate that aviation is not just about big business, exploitation of our environment, being bad neighbours from a noise and discharge perspective. Too easily, perception becomes reality. This week I had a very agitated member of a noise lobby group ring me. She described how her health had deteriorated, her family and neighbours were in uproar and that she hated where she now resided. I described to her the AIRCARE™ way of doing things and talked to her about our brand values. Immediately she saw that there was a different side to aviation one that has values around caring. Now I am not saying the specific issue is going to go away but what she was exposed to was a very different set of values. These are values people relate too. There’s views swirling around about our AIRCARE™ programme becoming the defacto regulator and for some this is a pretty challenging concept. The best regulatory systems in the world understand that the future is about addressing hazards and harm from a holistic perspective because this improves everyone’s efficiency . Quite simply regulators don’t have enough funding to be out there “beating the heck” out of everyone even if there’s a carrot attached but working in parallel with a responsive and responsible industry programmes like AIRCARE™ can provide additional levels of assurance to society while we at the same time benefit from business efficiencies – a win win for all .